God, “Have you considered my servant Job? There is no one like him on earth; he is blameless and upright a man who fears God and shuns evil.” Satan, “You have blessed the work of his hands… But stretch out your hand and strike everything he has, and he will surely curse you to your face.” (Job 1:8-11 abridged). A deal between God and Satan emerged in heaven to test a premise: *Could there be a righteous person on earth if God’s supportive help is taken away from him? This being at the center of Job’s life experience, the drama portrays the human response to this both of the sufferer (job) and the witnessing friends. The oddity of their responses, though natural, worked on two factors: One, both parties were ignorant of the real issue discussed in heaven, two, they were reacting to what they were seeing and experiencing on earth by applying religious rules. When God’s will concerning our life remains quite unknown to us, as is the case always, we all behave in similar manner albeit with different intensities. Job’s experience is a greater accentuation of this principle. Even so, Job’s story is very relevant to our present life on earth. Understood precisely in the light of *the issue raised in heaven Job’s story provides accurate lessons. If we omit the issue in heaven, then the issue simply reduces to “the suffering of a righteous person.” From this, other issues could be deduced: “Why then God remains silent” and “what the righteous person should do in his dire predicament.” These are the issues that any reader of Job may ask. Yet, these are not the real issues wen the issue in heaven is kept in mind. However, the actors in the story are ignorant of the issue raised in heaven. Only the readers of the story know. Even then, for the readers of the story, these are good questions to ponder because, just like the actors in the story, we too do not know God’s will concerning the life of each one of us on earth. Our life on earth is carried on purely on faith in God, and faith is only based on hope, and vice versa. How Job dealt with such a dire predicament in life purely on undiminished faith and love of God; and he held on to it till the end of his life through the most unbearable experiences, perhaps, any human being ever experienced in life. What happened in heaven was then immaterial to Job. However, he performed exactly as the issue in heaven was seeking to prove. For us, it is very important to know the core of the issue raised in heaven. It is critical for our life of faith. In our challenging life’s journey, the question remains if we could hold on to the faith and love of God undiminished till the end even though the God we trusted seemed totally silent. The other significant factor in Job’s calamitous experience is the various forms of suffering. It is not merely a) loss of life and property and demolition of his stature in the eye of the humanity that knows and respects him, but other suffering was piled on as well. That was, b) the tormenting wrong perception and judgment of his close friends (neighbors), c) Through the words of friends, Satan forces Job to believe the deceitful visions he produced as if they were from God (4:12-17; 33:14-18;36:3,4); d) Job was being forced to believe and follow the wisdom of the world in understanding matters of God and God’s will (5:27; 8:8-10, 13). All this means that these are Satan’s counter forces used on the true devotee of God to weaken and divert his faith from being steadfast. We too face such challenging claims from our well-meaning friends forcing us to do this or that. This is what happened in heaven. Based on this foundation God laid an unassailable character of Job for a test. Thus God declared that Job was blameless and upright. Satan retorted that a devotee’s faith in God and praise-worthy conduct were dependent on God’s protection given through blessing. He also added that removing divine favors would mean suffering, which also means a devotee rejecting God. If affliction was added Job’s rejection of God would hasten. On this note, Job’s experience began as a test on his faith and love of God. His suffering, in the story, was simply the result of a challenge between God and Satan. There was not a bit of Job’s misconduct that warranted such undeserved loss, pain and suffering in life. He was the ‘object’ of a test. So, Job’s story is no example to explain ‘suffering’ that humanity in general experiences. The only common principle good enough from Job and the entire humanity is this: Regardless of what happens in life, and however great the loss and suffering, it is proper for a person to love God and have faith in him till the end of life, because any other alternative means a fatal distance from God and loss of eternity. Job is under this remotely administered ‘test.’ Since the loss, pain and suffering came on him abruptly, it is not due to misconduct of any kind and in any measure. The story doesn’t show any blemish or misdeed. So, Job’s suffering was ‘not punishment for misdeeds.’ To this extent if Job said that his suffering was ‘unjustified’ and ‘undeserved,’ he was right. Since he didn’t know of the ‘deal’ in heaven, he could have construed it as a ‘punishment’ for sin, which only God could have seen. However, the issue was very vexing on Job’s mind. Such a catastrophic experience of the loss of life (sons and daughters), of livestock, of houses and possessions by successive assaults and the sudden curse of tormenting sores all over his body certainly indicated God’s displeasure with him; at least he thought so. Yet, through all these Job stayed steadfast in faith never blaming God for this malady. At the most, he sorely wished he was not born at all. Understandable is man’s agony at such body affliction and searing pain to say how he wished he didn’t exist in the first place, or that he died right way. People on earth, even Job, knew nothing about God’s thought about Job. If not in that extremity, but to a great extent, what happened to Job is just as what happens in our lives today. If loss, suffering and pain persisted, people’s faith in God would unsettle; some would leave God and try other gods; or, go to different sacred places, to different holy people, take up different religious practices, etc., all with the hope that they might have powers to help or even make them prosperous. That is how gods are prolific in the world, then and now. This means, people measure God’s love by the blessings they experience in life. Or, the strength of their faith in God depends on how God responds to their religious practices, prayers, pledges and offerings, etc. If there are no blessings faith in God slackens. This is how Satan tried to wean people away from faith in God. Job was an exception to this rule. If God’s point succeeded, it has implications to Satan’s theory and his sinful world. After all, Satan’s business was to wean people away from God the Creator. For Satan, Job was a dangerous counterweight. So, Satan came to earth to spread a ‘lie’ about God’s mind, will, word, and judgment. Satan wants to show the righteous as the unrighteous, the pious as the impious. In the world of such perceptions, Satan gained a number of agents to advocate his cause: first, Job’s wife from his household, then Job’s friends. They all started speaking Satan’s language, yet not knowing Satan was the mover. They all, in various ways, were singing Satan’s song. The irony is that they all, while doing Satan’s work, used God’s name profusely and throughout. A double deception and abominable duplicity! Job’s wife said, if this God didn’t help, what’s the use of him? Curse, reject Him and die. She meant that God who doesn’t help doesn’t deserve our trust and worship; and certainly deserves to be rejected when he hurts us. The friends gave a different angle. Satan propounds the theory in the following way: When we are so faithful to God and religious, God is expected to bless and protect us from all hardships. Now that He caused trouble means that He is not satisfied with Job’s faith and conduct. This is God’s way of dealing with the righteous and the sinners. This is Satan’s message then and now! Such is the meaning of human religious experience throughout its history. Job’s friends tried to impress upon him that this wisdom of the elderly and the teaching of our fathers was worthy of following. As such, this continues to remain the tenet concerning our faith in God and His relationship with us based on our faith. This has been the time-honored and proven fact (5:27; cf., 8:8-10, 13). Even so, what happened to Job is quite within God’s justice; such was the conclusion of the friends (8:3). On this basis, the friends started narrating all the possible areas of Job’s deceitful conduct. 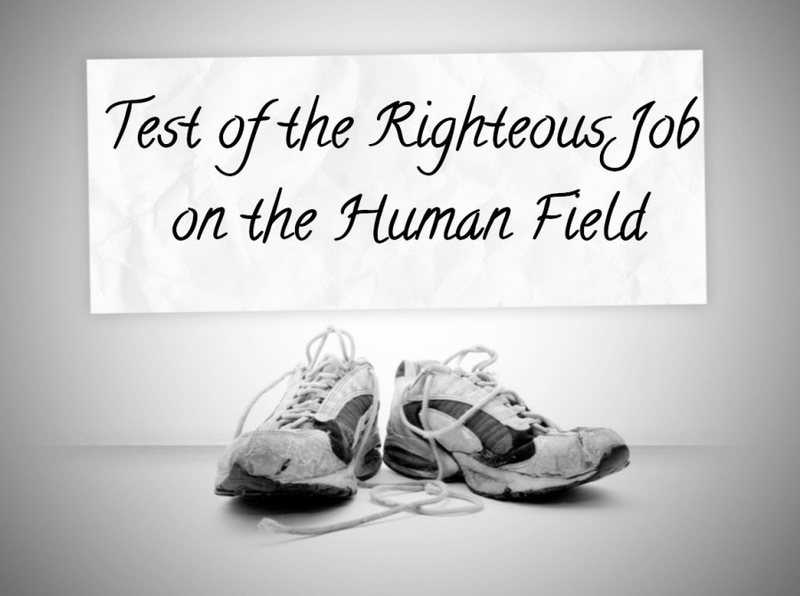 If Job were really religious, honest, never doing evil, this hardship would not have happened. He posed as a devout man, they said, when he was really sinful. God never causes hardship on the truly honest and righteous; it’s God’s job to watch and bless the truly honest and religious people. What Satan came to spread on earth is getting done by the perverse reasoning of Job’s friends. In all this Satan’s purpose was to weaken the faith in God Who is not helpful when His faithful devotee is experiencing hardships in life. Job, on the other hand, robustly refused this theory. He refutes the notion that God was ‘bound’ to bless you for faith and religion. God’s will is sovereign and He has freedom to do anything with any person for any reason. Job agreed that if sins were the reasons, then no person in the world is born free of sin, and all deserve God’s punishment; not even his friends are exempt from this even though they are arguing like men without sin. While readily agreeing that if God asked a thousand questions, he cannot answer just one (9:3). If so, Job asked, if God examined the friends would they be found sinless (13:9). Man would always stand guilty before God. Therefore, these blessings are not rewards for perfection in a person, or for his religious honesty. As per the arguments of friends about the wisdom, Job contends that their wisdom is like ashes (13:12; 17:10). And of the wisdom of the old and the wise through the ages, Job said, ‘in God is wisdom’ (12:12 &13-25); God’s wisdom strips away, even nullifies the wisdom of all the counselors, judges, kings, priests, elders, the mighty, the saints, and the wise men. God’s wisdom overrules all this human wisdom and knowledge. Ultimately, wisdom is in the fear of the Lord and understanding is in eschewing evil (28:28). Job’s experience shows how he fought these hostile forces because he perfectly understood God’s will concerning the life of man on earth through his own life’s experience. With this strength he kept his faith and love of God un-shaken, un-breached and steadfast through all the troubles even though God remained totally silent in his situation. A great lesson for us! Can Man’s faith and love of God stand by itself without God’s blessings?...cont. Can Man’s faith and love of God stand by itself without God’s blessings?